I wake at 7.00am and I see that Tam is already sat out on the balcony. To my (and her) amazement, shes feeling fine with no obvious repercussions from her drinking antics, other than her inability to remember anything after we left the Sky Lounge. Our port of call today is Yorkeys Knob and believe me, Ive made every possible joke about this place name already. We are booked on a tour to be picked up at the dock at 10.45am, but this is a tender port and tendering is not due to start until 10.00am. Given the slow nature of the tender process it is important that we are on the earliest possible boat. I walk up and get a couple of coffees and a sticky bun each from Café Al Bacio and then queue up outside Cellar Masters to get the tender tickets. We are on tender 5. Back in the stateroom we gather our stuff for the day and walk to the tender boarding area on deck 3. Here we wait with half the ship for the tendering process to begin. 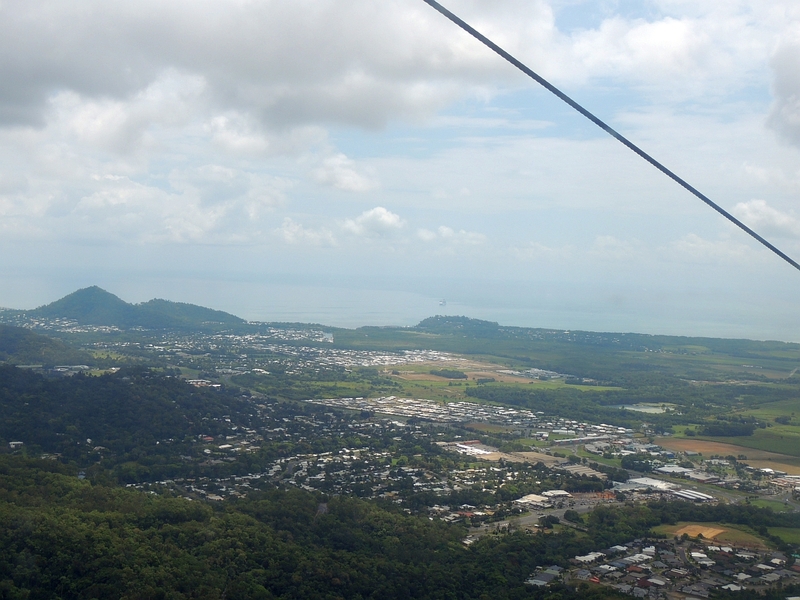 Our tour is picking us up and taking us to the Skyrail, where we will get a cable car up to Kuranda. Unfortunately we will only have an hour or so here before we have to get the train back down. Its a bit overcast today, but with very little breeze. Luckily the tenders start boarding slightly early and we are on our way to Yorkeys Knob (oh,er!) before 10.00am. 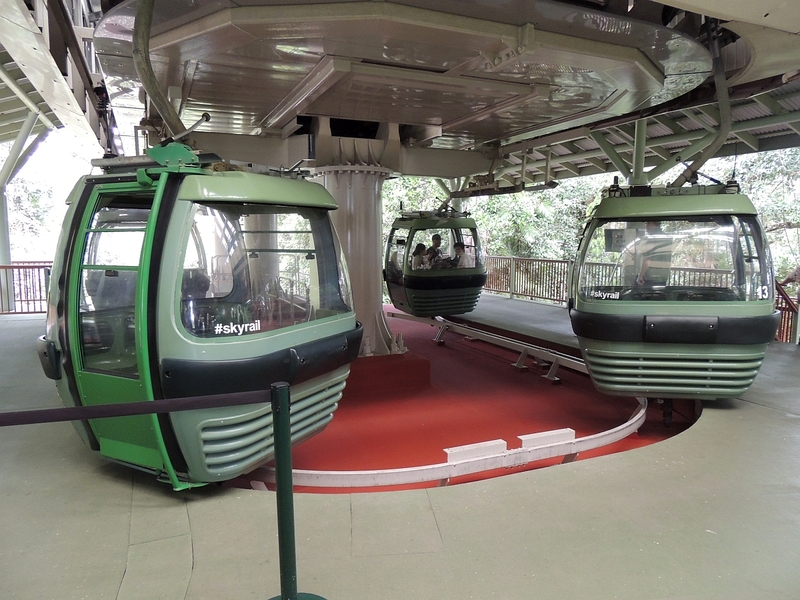 We find the shuttle for our tour and have a short drive to the Skyrail. 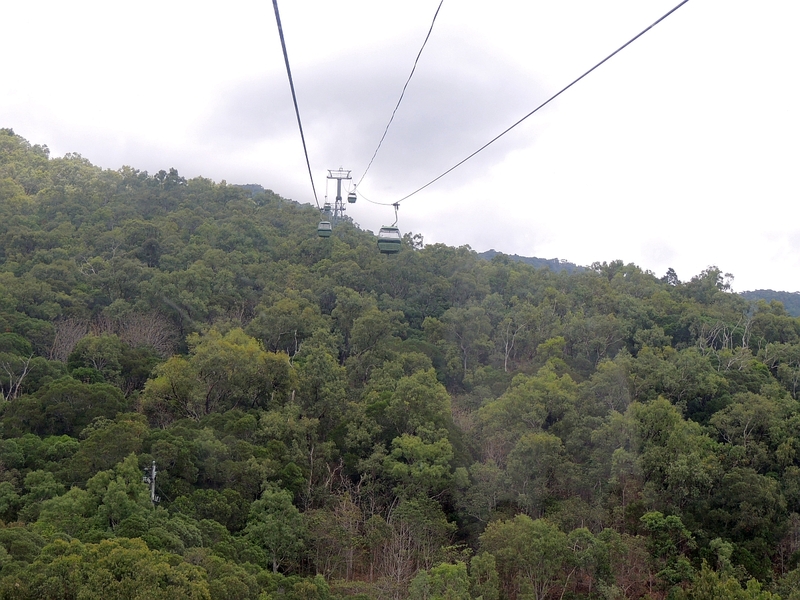 This is a cable car that is 7.5km long and travels over the rainforest on its way to Kuranda. 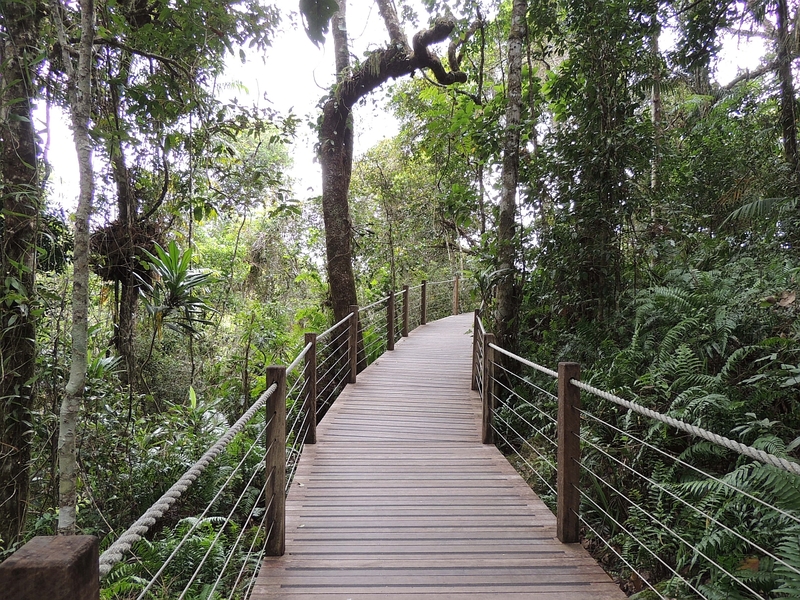 There are two places where you can get off and use the boardwalks into the forest. 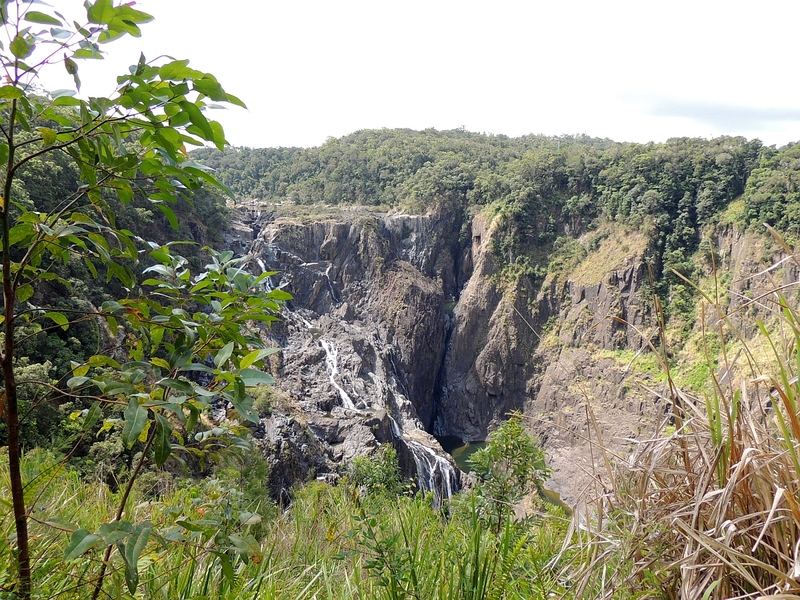 The second stop is at Barron Falls, which is very pretty, but its not exactly a torrent of raging water. 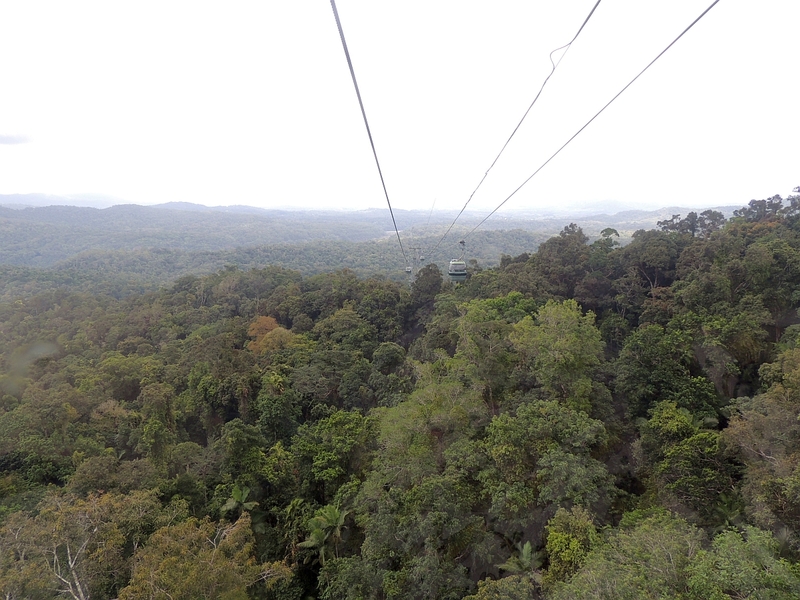 The glide above the rainforest is very peaceful with only the slight clatter as we go over the pylons. 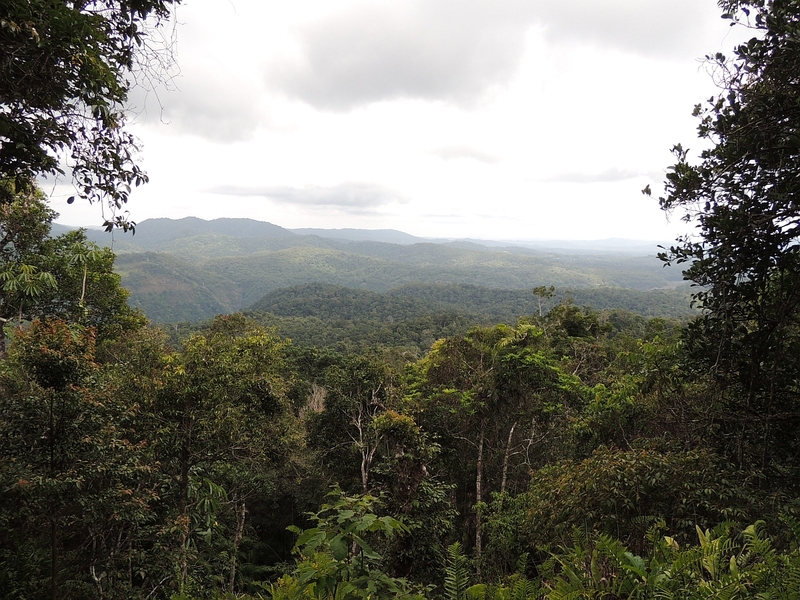 We were told by the guide at one of the stops that they had to use a helicopter to bring in all the materials for the pylons in order to reduce the impact on the rainforest. 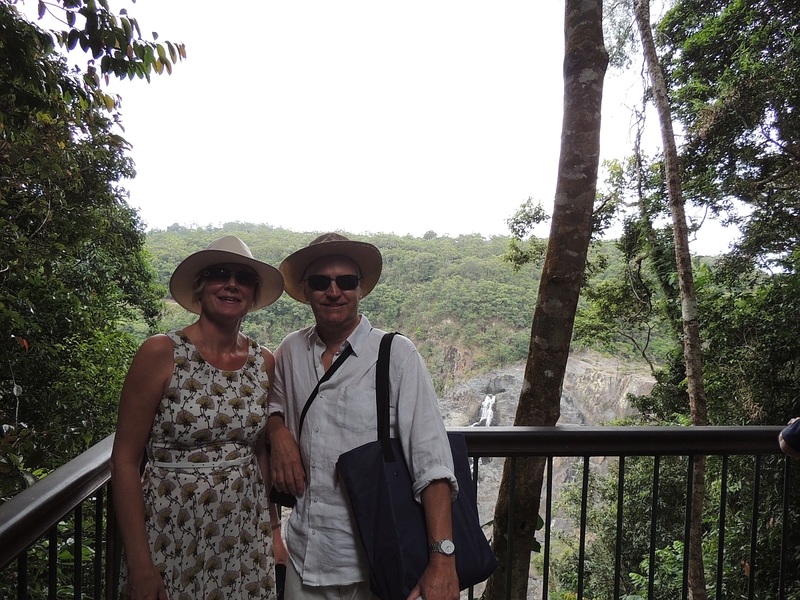 We arrive in Kuranda and walk up the hill into the town. Theres not a huge amount here other than shops, cafes and bars, but its pleasant enough and we mooch around for a while and I buy a couple of t shirts. 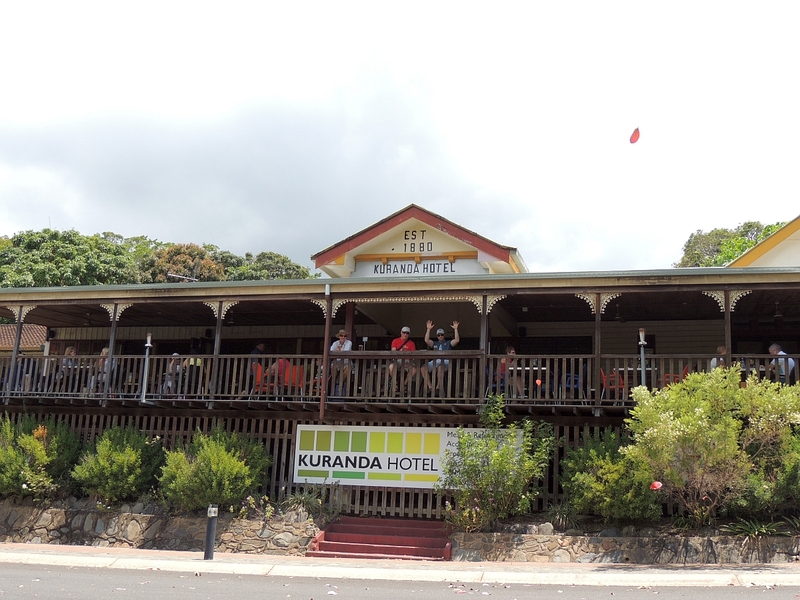 We have lunch on the veranda of the Kuranda Hotel. I have the barramundi and Tam orders the burger. This is pretty huge, but full of meat and Tam enjoys it. The barramundi is good too. Having never previously eaten it before, Ive now had it twice on this holiday. 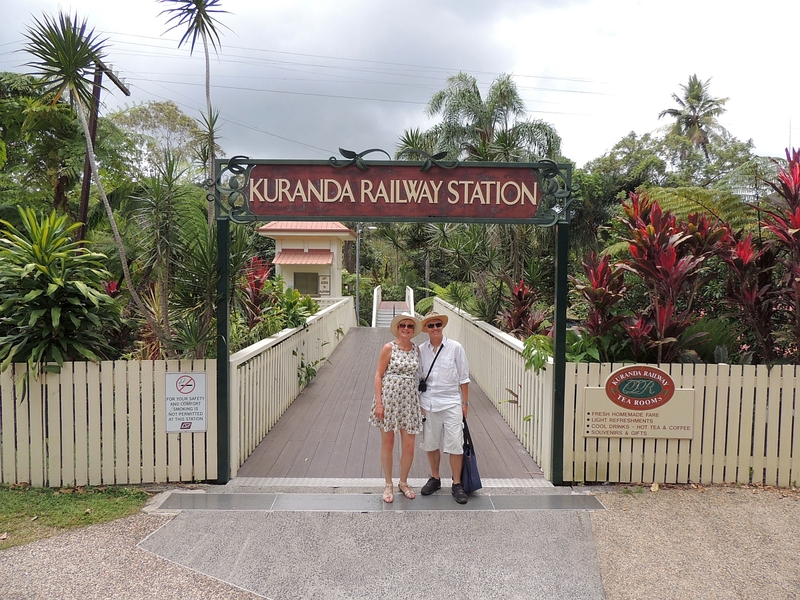 We have another quick look around Kuranda before walking back to the train station. Before we board the train we walk down to the river and stroll along the bank for a while. 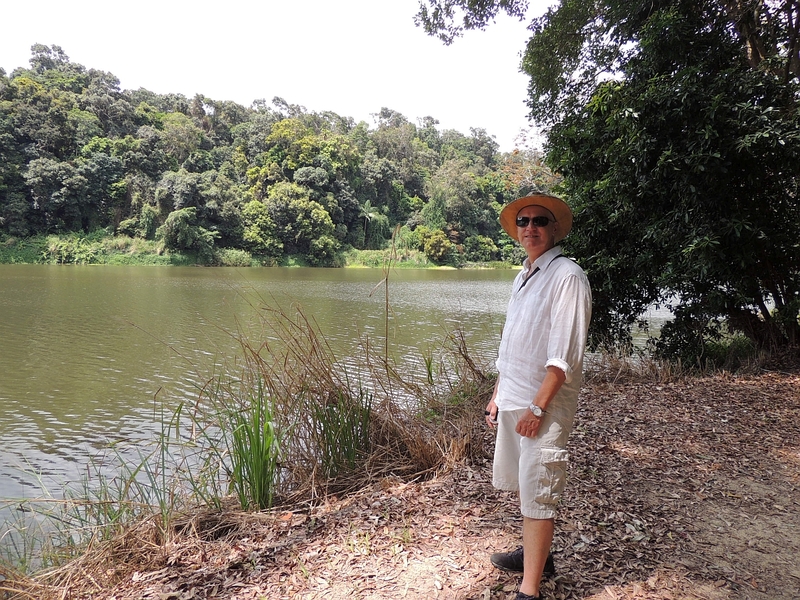 This is very nice as its really quiet and the rainforest tumbles down to the waters edge. Back to the station for the 2.00pm train back to Freshwater Station. 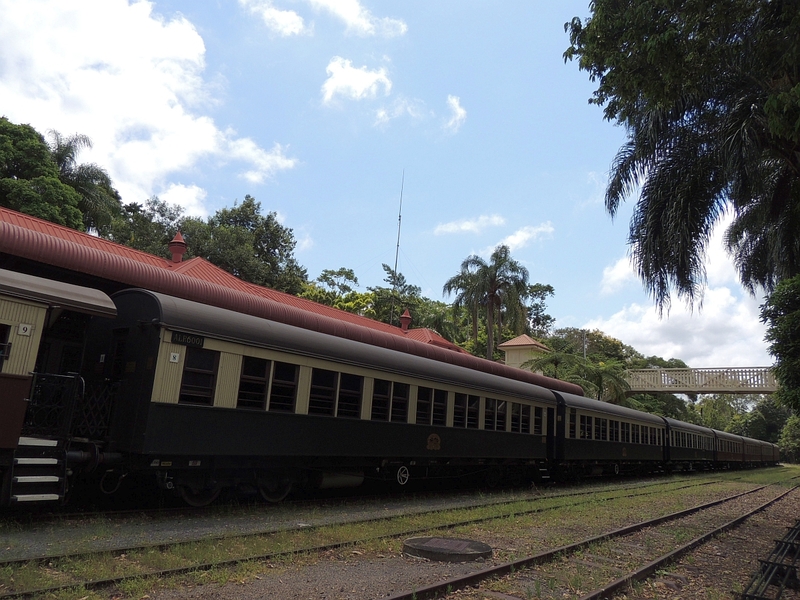 The Kuranda Scenic Railway is over 100 years old and has carriages that date back many years as well. The seats are bench style in rows of 4 facing each other. Seats are assigned on your ticket, so you have a pre-booked space. Unfortunately our row of 4 is already occupied by a rather large man and woman. He reluctantly moves his backpack so we can sit down, but leaves us not much more than one space for the two of us. It is also very hot, even though it is open air through the bars that are windows. It also doesnt help when a family with a small baby sit in the same carriage. This child knows 101 ways to show its disapproval  96 of them are very loud. 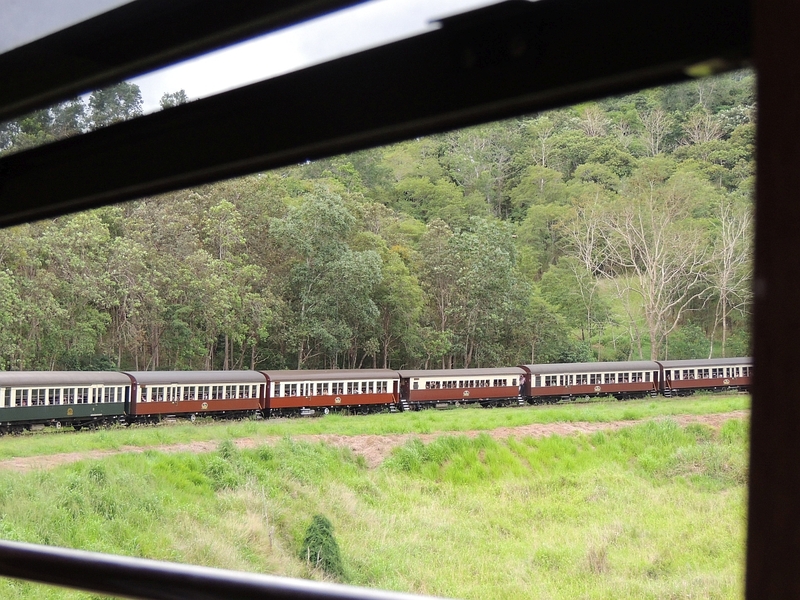 Luckily we are seated by the window  if you have the two seats on the right hand side of the train you really dont get the same experience as everything to see is outside the left hand window (as you face the front of the train). If you ever do this I would advise paying extra for the gold service, which gives you individual chairs and much more room. Unfortunately it wasnt available on our trip. 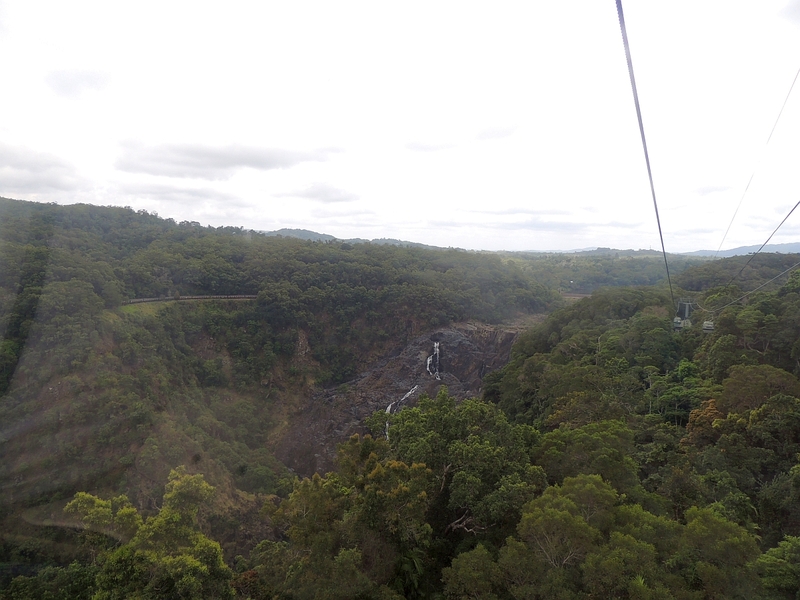 The journey takes 90 minutes and you stop once at Barron Falls, which gives a view from the opposite side of that from the Skyrail. 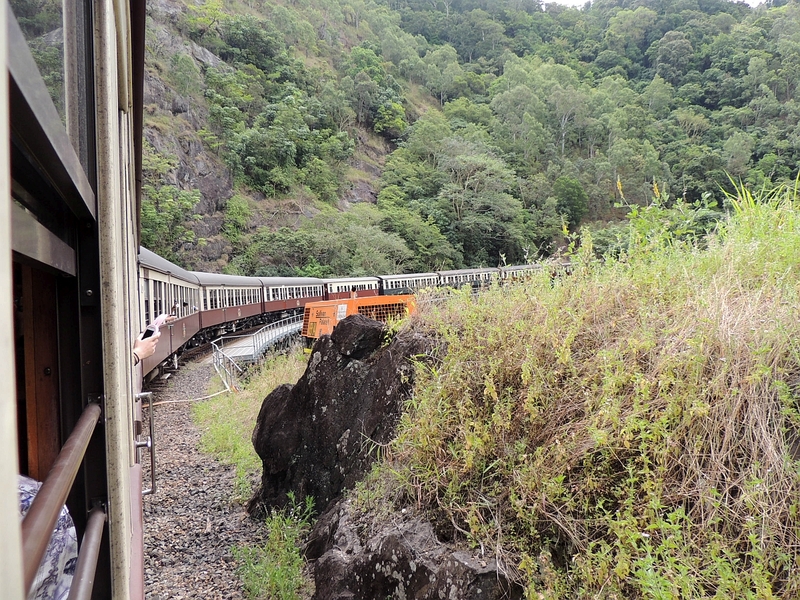 Most of the time you see nothing but bushes, trees and tunnels, but every now and then there is a really spectacular view, especially on some of the bridges, which are on bends and you can see the exceptionally long train snaking around the hillside. The cramped conditions, heat (I wouldnt want to do this in the height of summer) and squawking infant mean we dont enjoy it quite as much as we thought we would. The Skyrail was much more fun. 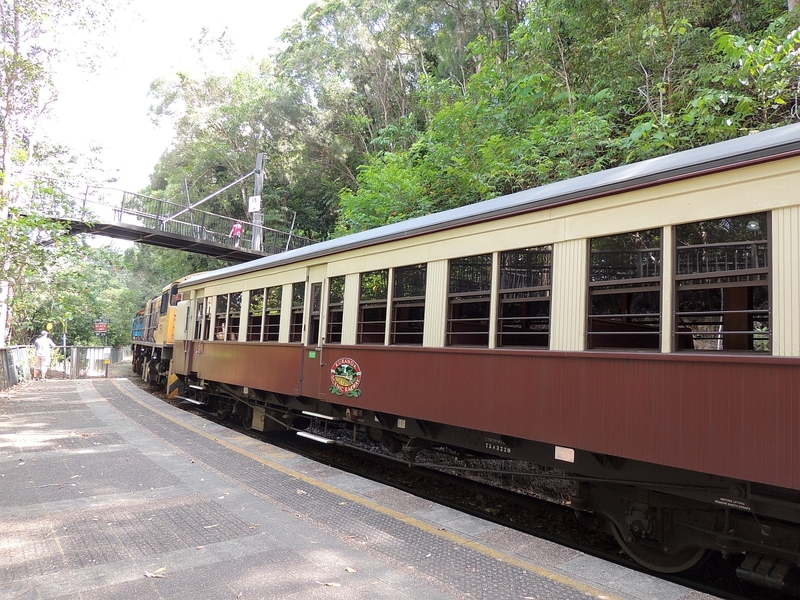 At Freshwater Station there is a coach waiting to take us back to the port at Yorkeys Knob. (Stop it! It was funny the first time, but youre just being childish now). There is an enormous queue waiting for the tender and they fill up a huge catamaran to get everyone back to the ship. A combination of loading at the dock and unloading again at the ship means it takes over 75 minutes. Back on the ship we go to the Passport Bar to get a refreshing cocktail to take back to the room. We both have a Mexican Firing Squad, which is, as its name suggests, a tequila based drink. One thing I would say is that most of the cocktails are very sweet and fruity. A bit like my good self. In the stateroom we enjoy the drinks and nibbles that are delivered every afternoon as part of our Aqua class package. Most of the time we dont bother, but they are appreciated today. Its getting warmer every day as we head north and its very pleasant to sit on our balcony as evening starts to fall. We shower and go to the Ensemble Lounge, where I have a Negroni and Tam has a Strawberry Daiquiri. We take them with us to Tuscan Grille where we have an 8.00pm reservation. We havent had too much luck with our table positions on our cruise so far, usually being tucked away in a corner somewhere, but tonight we sit by the window looking over the wake of the ship as we power along. Our server is from Italy and tells us his name is Ricky Riccardo. Surely he made that up? Anyway, hes very good. Tam and I are going to share the meatballs to start, but Ricky talks us into having the crab cake as well as he says you only get two meatballs. Hes right you do only get two meatballs. What he neglected to tell us is that they are the size of tennis balls. This might be a slight exaggeration, but were not sure whether to eat them or have a quick game of boule. We both have the Filet Mignon for our main course with shared sides of garlic mashed potato, eggplant with parmesan and spinach. The steak is excellent, really tender and cooked to perfection. With a couple of glasses of red wine, the whole meal has been very good, but we are too full up for dessert, much to Rickys disgust. Our next stop is the World Class Bar where I have a Bulleit Infusion and Tam has Ciroc Citrus(?)  or something like that  its basically a fancy Pina Colada. We get chatting to a young couple next to us who live in Las Vegas. We tell them about the lovely little cakes in Café Al Bacio and Rahadian (the barman, remember?) says Oh, you must try them and disappears off and gets a small assortment for us to sample. Top man is Rahadian. Much to Tams chagrin, shes too full from dinner to participate in cake eating. Cellar Masters in next and I have rather large glass of Chardonnay and we sign up for the Riedel Wine Tasting for later in the week. We are at a bit of a loss as to what to do now and find ourselves in the Solstice Theatre watching Dancing With The Solstice Stars. This is a sort of Strictly Come Dancing show with a member of staff and someone from the audience pairing up in a dance competition, 6 couples in all. They also have 3 judges passing comment on their dancing. Its all done in a humorous manner and the dancers dont mind making fools of themselves. We last until they are down to the final two pairs before even Tam has had enough, theres only so much cheesy entertainment a person can take. To be fair, this has probably been the most entertaining theatre show to date, which gives you some idea of my opinion of the shows so far. A stop off in Café Al Bacio on the way back to the room is called for. We have a coffee and a small éclair each. Its midnight and apart from a few people around the Martini Bar, the place is empty. Lord knows where everyone goes at night, perhaps theres a late night party somewhere deep in the bowels of the ship.